eloise: there are bleachers in the park by our home. You have worked your way from walking along the bottom bleacher holding my hand, to walking along on your own to trying to climb to the next one up (and not making it) to, just this week, climbing up to the very tippy top all on your own (and with butterfly wings on). You weren’t scared. You didn’t ask me for help. You got up there, sat with your back against the fence and gave me the proudest look I had ever seen on a 19 month old’s face. You beautiful, determined child. -joining jodi for this year’s 52 project! 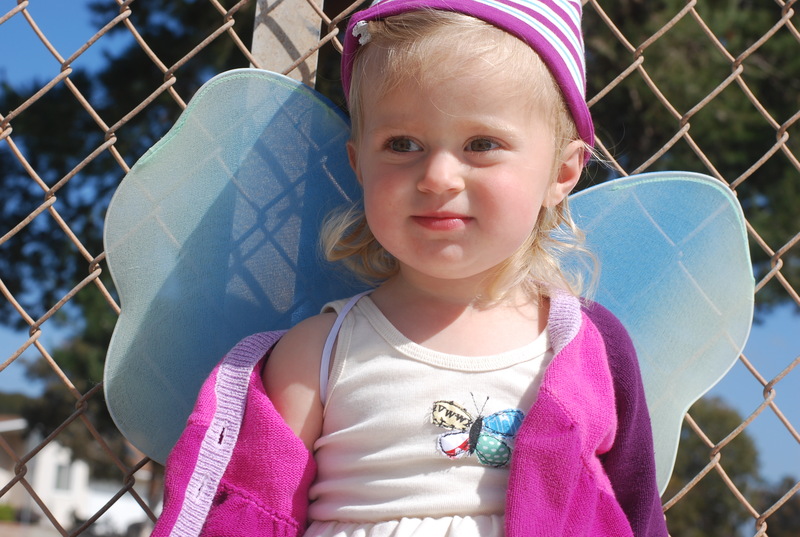 This entry was posted in 52 project and tagged 52 project 2014, butterfly girl, climbing the bleachers, determined child. Bookmark the permalink. Kim, she has been living in those wings the past week or so!! It’s adorable! Oh I’m so glad you stopped in!! I was just thinking of your blog the other day and couldn’t find it. I’m so happy you came by mine so I could pop in and see how your two littles are doing. Jessica has grown so much! I will hopefully be stopping in much more for your portrait project now that I know how to find you. 🙂 xoxo!